Campaign Chair Samuel G. McCachern show with United Way Cabinet Members. 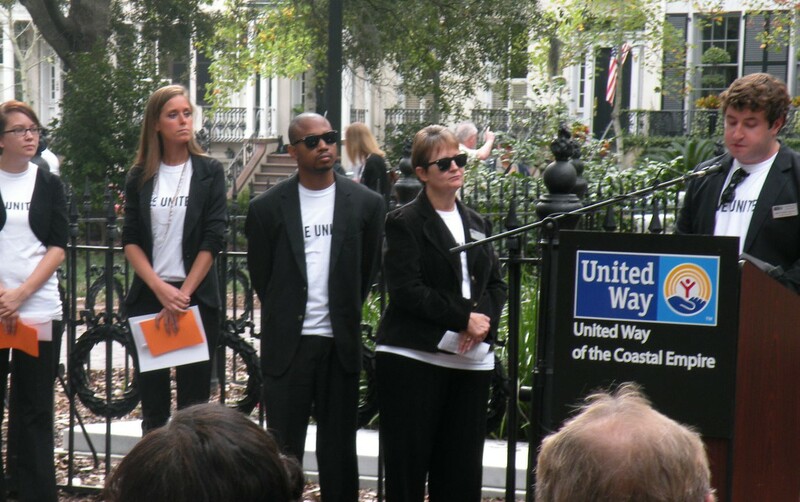 Halfway through its campaign, United Way of the Coastal Empire reports it has raised $3,957,523 or 45 percent toward the community wide goal of $8,777,007 to help people in the Coastal Empire community. The campaign ends on Nov. 16, 2012. 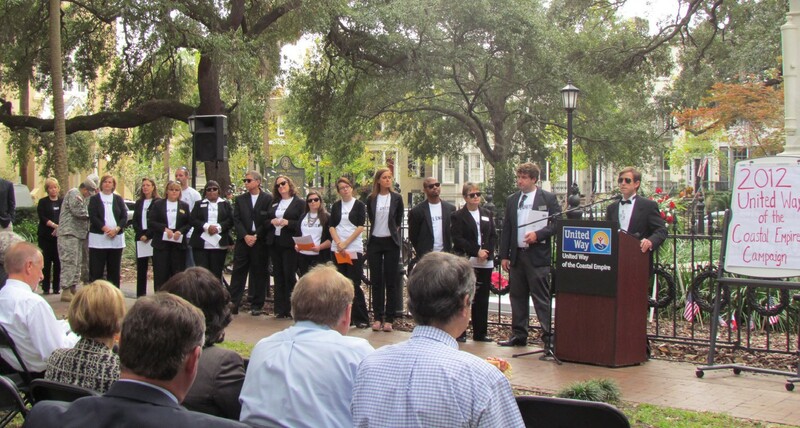 With four weeks remaining until the conclusion of the campaign, 2012 Campaign Chair Samuel G. Mc- Cachern, senior vice president of Thomas & Hutton, reported the results during a festive Mid-Campaign Rally held at Monterey Square. Since early September, hundreds of corporate and community volunteers have spent thousands of hours canvassing the Coastal Empire area to help United Way reach its goal. Funds raised during the annual campaign help support human service programs that improve the lives of people in Bryan, Chatham, Effingham and Liberty Counties. Priority funding goes to successful programs in the issue areas of Education & Youth Development, Economic Independence, Health & Wellness and Basic Human Needs. United Way Loaned Associates and the companies and organizations that have generously donated their services and resources to aid with this year’s campaign. Loaned Associates play a vital role in an effort to raise funds to help improve people’s lives. Loaned Associates are part of United Way’s campaign team that calls on other businesses, helping them organize their workplace giving programs. Special thanks to Jenny Gentry of Wells Fargo for her recruitment and leadership of the Loaned Associates program. As part of this year’s campaign, United Way of the Coastal Empire offers individuals a chance to win one of many gifts as a way to say thank you for giving United Way the opportunity to present the work we are doing to build a better community. The gift list includes $1,000 worth of groceries, a shopping spree, vacation packages and more. Anyone attending a United Way event or campaign meeting at their place of employment is eligible to enter. United Way will periodically select the winner(s) beginning Sept. 6, 2012 through Nov. 16, 2012. No donation is required. The final fundraising total will be announced at United Way’s Victory Celebration on Friday, Nov. 16, 2012 at 11:45 am at Hyatt Regency.